I built some bookshelves for my little turd muffins room. I was really really tired of all his books being in boxes. Can't really read them that way. Now I finally have somewhere to put 'em all. With TONS of room to grow! I built three of them. I was gonna put them all on the wall behind the door. But after hanging them, I hated the way it looked. So I took them all down, and decided to put two behind the door, and one over by Ry's crib. I am gonna put big letters that spell out "READ" above the two that are behind the door. I designed, built, painted and installed these all by myself. Besides the few cuts in the width, that the stupid Home Depot guy messed up on, they turned out exactly how I hoped! I'm so proud of me!!! Here are a couple detail pictures. And here are a few where you can see some more of his room. And a peeky in Riley's room. I'm getting so close to finished. Eeek! I can't wait to have it ALL done, so I can share! Me and him both LOVE to be in there!!! The whole room is amazing! It is really hard to capture the cuteness of a room in a picture too, and it looks awesome in the pictures, so I know it would be totally amazing in person! Oh, and btw, I have been trying to talk Josh into making me those bookshelves for like 2 years! I'm so jealous! I love these!! :) Great job! Wow I totally love the room! It's so beautiful! Good job on building the shelves, you must be talented and your son is adorable. I hope you and your husband make many happy memories with him! I LOVE THE ROOM!!! So awesome, you did a great job! i accidently hit the "next blog" tab up top of my blog and yours popped up! haha. this nursery is seriously stinkin' cute! This room is so cute!! very nice job. It has given me inspiration for my own baby's room. Hey, Awesome nursery! It looks great! Interviewer. 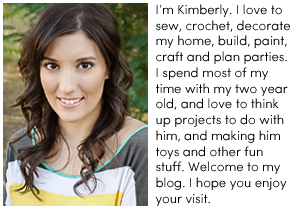 We'd like to give you the opportunity to give us some insight on the "person behind the blog." It is new so not too impressive yet. Still finding time to revamp cool finds.\ Great site. I am so envious of this room!!! oh my goodness I wish my room looked that colorful and awesome! great job! this nursery is seriously stinkin' cute! I meant to ask you, where did you get that chair thats in his room? I stumbled on your blog and love your nursery! I would love to make these book shelves for my son's room. Did you use directions or a pattern from somewhere? The whole room is so cute! !